Alexa rank is considered as one of the key factors in deciding a website’s standard. Right now google.com is the site with rank 1 followed by Youtube and Facebook in second and third places. I started this blog last month, I wanted to track this blog’s alexa rank. I don’t want to open alexa site always and check if rank has been increased. 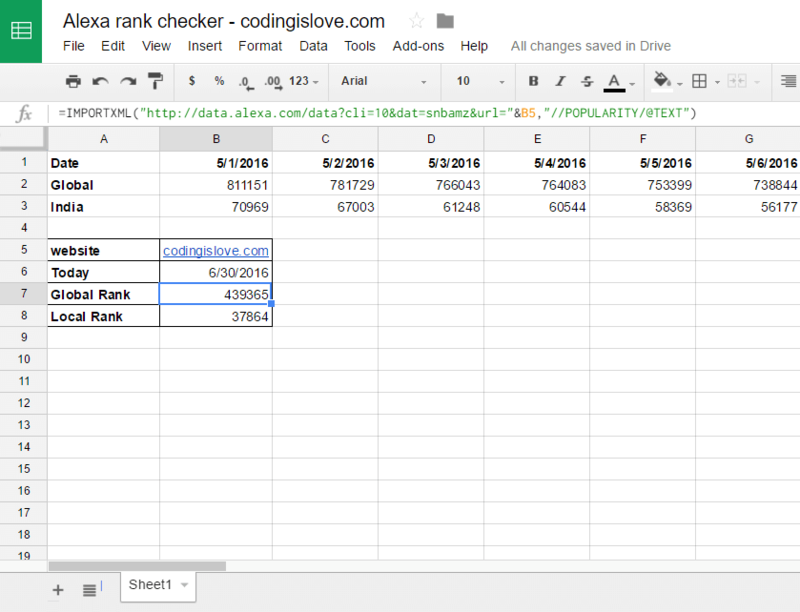 So I just wrote some code and developed an alexa rank checker in Google sheets. This Alexa rank checker will check blog’s alexa rank daily automatically, compare it with previous day’s rank and mail me if there is an increase in rank along with details like old rank, new rank, change in rank etc. If you have a website, then you can take a copy of this spreadsheet here – Alexa Rank checker and use it for your website by changing the link in website column. Read on if you want to know how is it developed. I used a combination of Google sheets built-in functions and Google apps script code. Although It can created using only apps script code, I used both to make my work easier. This API responds with an XML which can be parsed to fetch the rank. These formulas just fetch alexa rank, lets write some code and add a timed trigger to check rank daily and send an email notification if rank increased. Don’t get confused with the word ‘increase in rank’ in this post. Lower the rank, better it is. htmlBody:"New global rank is " + globalrank + " increased by " + globalchange + " ranks, New local rank is " + localrank + " increased by " + localchange + " ranks"
This code compares rank with previously stored rank and send a mail if rank has gone up. If no previous data is stored then it just stores the data with current date. Google sheets timed trigger is used to run this function daily. Google sheets timed trigger is nothing but a scheduler, Just set the time when you want to run a function and it runs at that time. I set time to daily between 9 AM to 10 AM. First we get current sheet using getActiveSheet method, then get last column of sheet using getLastColumn method. Last column is used to access previously stored data and also to store current data in next column. Global rank and local rank formula is used in B7 and B8 of the sheet(have a look at screenshot or open spreadsheet link above). Save global rank, local rank, old global rank and new global to specific variables. Last 3 lines store current data to next column of the sheet. Code is almost self explanatory once you have a look at it. Now just add a daily timed trigger to myFunction by clicking on the clock button in script editor, as shown in screenshot below. If you want to make this completely using apps script, then UrlFetchApp can be used to fetch XML and XmlService can be used to parse XML. Google sheets automatically generates graphs and charts for data in the sheet. once you have 4 to 5 days of rank data, click on any cell with data and click on Explore button in bottom right of the sheet! Prev Game that made me play 1000 levels! What an article. Finally found an solution with full details, keep sharing. Hey, Country (local) rank check does not work anymore… any fix? Hi Alex, They have removed country rank from this API now. You have to use other APIs available at https://aws.amazon.com/alexa/ which has free tier but needs an AWS account. Ah I see. Thanks for the quick reply! Thanks so much for these little tutorials. Really helpful and much appreciated. I’m looking to have an email sent if a cell within a column populates. works properly with the column range. How can I get this working properly? Hi, I did not understand your question. Above code already sends an email whenever rank is increased. thanks for the spreadsheet, i was looking for the same since morning and astonishing that most of the bigger and reputed site’s code was not working. But, your code worked perfectly. Alex commented earlier that local rank is not working but when i checked it is working perfectly. Thanks Ranjith for your help getting the conditional email script working. I am a beginner and just changed the url to track my website’s Alexa Rank. But The upper part date & Rank Columns are still showing your website’s statistics. Is there a way to change them too to show my own site’s Alexa daily data ? Thanks a lot for sharing this wonderful work with us ! Take care. Hi Doreso, Just delete the data in upper colmuns now. The script will start pushing your site’s rank from tomorrow. Hi Ranjith…Your tutorials are really helpful. Thanks so much!! Great explanations, finally I’ve landed on a right place to get resolved. I have my own business where I want to send mails to either clients or to myself being a notification or reminder. Let me explain you, say I have a campaign running on from 01.05.2018 till 31.05.2018, here I want a reminder mail to be sent to me/client for campaign extension based on my spreadsheets with a notification on mail stating “reminder” at least 3-4 days before the expiry of 31.05.2018. Hope you got my query, Kindly do the needful. I have modified it a bit and transposed it to columns and sorted the dates from new to old.